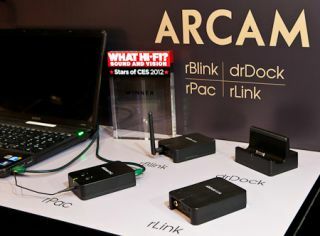 BRISTOL SHOW 2012: Arcam's expanded r range boosts mobile music | What Hi-Fi? Fresh from winning a Stars of CES Award in Las Vegas last month - as it proudly displays above - Arcam is showcasing the winning rPac portable DAC here at Bristol, alongside other members of the extended 'r' family of digital music boosters. The entire pocket-sized range - priced from £150-£200 - is set to hit shops by early March. The rPac is a USB DAC and headphone amp, the rBlink an Apt-X Bluetooth wireless streaming solution and the rLink an optical/coaxial DAC. Each costs £150. The drDock, meanwhile, is a digital dock for your iPod, iPhone or iPad, bypassing your Apple portable's DAC to enable superior sonic performance. It has an HDMI video output as well as an SPDIF audio output, and comes with a remote control. It can also charge and sync your Apple devices. The drDock costs £200.